Sen. Tim Scott: Charleston Shooting Was 'A Crime Of Hate' Sen. Tim Scott, Republican of South Carolina, shares his thoughts on the shooting at the historic Emanuel African Methodist Episcopal Church in Charleston. 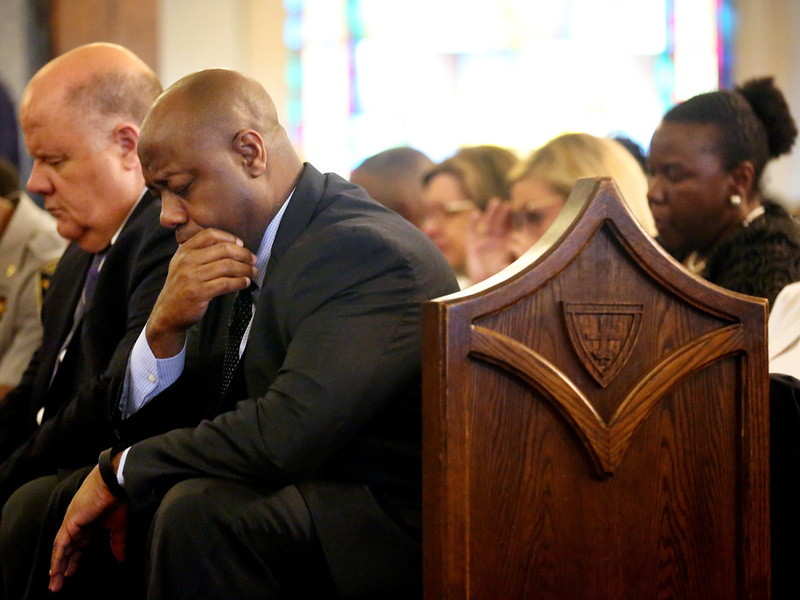 U.S. Sen. Tim Scott bows his head in prayer during a prayer vigil held at Morris Brown AME Church on Thursday, June 18, 2015 in Charleston, S.C. The service honored victims of Wednesday's shooting at Emanuel AME Church. Sen. Tim Scott, R-S.C., returned to his home state the day after nine people were killed in Charleston's Emanuel AME Church. The crime was emotionally devastating for many of his constituents, and the senator himself lost a friend in the attack. He took time out for a wide ranging conversation about the shooting, what he believes may have caused it, and how he'd like his state — and the country — to move forward. A version of the interview aired on Here & Now. He was a Democrat, I'm a Republican. When I got elected to Congress, one of the calls that I received, one of the first that I saw was Clementa Pinckney, and his goal was to find a way for he and I to bring people together. And one of the ways that I hope to remember him is to work harder at bringing people together. To be a bridge that makes sense, and to be included in the conversations, no matter how difficult they are, no matter how varied the topics, to be a part of the conversation of restoring hope and creating opportunities for as many Americans and as many around the world as possible. That is how I think I can best serve my friend who is now gone. Anyone who has the level of hate in their heart that it scrambles their brains, perhaps someone would call that mental illness. I just call that hatred. What gun law would have stopped a person with a hand gun? The only gun law that comes to mind that can do that is banning guns, and I am completely in opposition of that. I think it's very clear that we are looking for a solution that a new law may not be the answer to, in this case specifically. He was already breaking laws by having a gun because he was awaiting a felony charge. He certainly took a gun into a place where you can't take a gun into, which is a place of worship. So, the laws that are on the books did not stop him from doing so. It's the old saying that ..."locks are for good people." In other words, if you have someone who is willing to obey the law, it will work. Unfortunately, the fact is that there isn't a law that someone can think of that would have prevented this situation. I don't know what matters to me more than the fact that I've lost a friend. Us trying to put the definition of why he did what he did is not as important to me today, as it may be in a week. Today, I know that my friend is gone, and eight members of his congregation [are] gone, because of someone who was so filled with hate, so filled with venom, that they acted out in the most violent horrific way possible, and that grieves my heart, and cuts my soul ... As we all will look for labels to put on this situation, I think we can all agree that this was a crime of hate, and that this is a challenge that we will have to address, and that we will address as a community. The Rev. 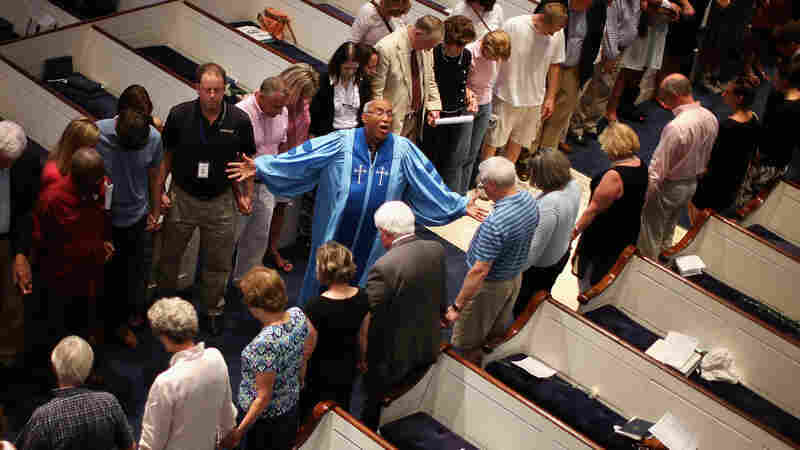 Sidney Davis leads mourners at Charleston's Second Presbyterian Church during a community prayer service for the nine victims of the shooting at the historic Emanuel AME Church. I just received a text from a friend of mine from Colorado saying he was praying for me and praying for my people. And then he corrected himself and said, "I'm praying for our people because we are — in essence — one before the good Lord, and one as a nation." And frankly, that's how I see this. I see this as an issue of a demented, evil person striking terror in the hearts, and then killing nine people. Was race a factor? Obviously! He said that he was going to kill black people so there's no doubt that race is one of the motivations, and frankly I'm sure that he will get justice at the fullest extent of the law. I think it's hate. I don't think mental illness is the reason why he did what he did. I think anyone who has the level of hate in their heart that it scrambles their brains, perhaps someone would call that mental illness. I just call that hatred.